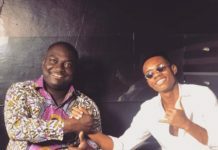 Gospel musician Isaiah Kwadwo Ampong is still bitter over his allegation that Daddy Lumba has not given him a dime from the launch proceeds and sales of their joint album, Hosanna. He has told DJ Roar on Kesben FM in Kumasi his next plan of action if Daddy Lumba refuses to give him his share of the money generated from their joint album. 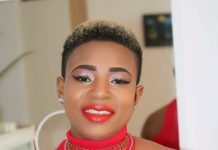 Ampong during the interview pleaded with family of the ‘Yentie Obia’ hitmaker to advise him because things are not the same for him as it used to be. 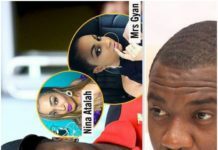 When DJ Roar, host of the entertainment show questioned him what his next move would be if Lumba does not give him his share of the cake if indeed he is camping GHC340,000, he answered that “His family is in Kumasi so I believe they will talk to him but if he does not listen to anyone, there is only one thing that he told me that I still believe. The gospel musician continued he is optimistic that all those who pledged to give them money during the album launch have honored their promises. “Everybody who paid has called to inform me and all those who gave cheque have also called to tell me that Lumba has cash-out the money. I pretend as if I know about Lumba going for the money when they call me but I didn’t know anything about it.” he added. Great Ampong not long ago on ATV accused Daddy Lumba of walking home with Gh 200,000 during their album launch, which happened last year November at Glorious Wave Chapel International in Accra. 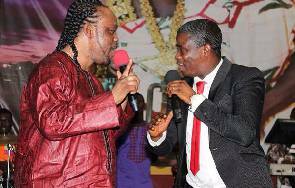 He added during the TV interview that a sum of Gh 140,000 from the album sales is also with the highlife legend. Lumba has been quiet on all allegations level against him.